In this lesson, students learn how to compute the Mean Absolute Deviation and the Standard Deviation. 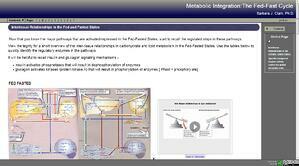 This lesson teaches students how to identify the different metabolic pathways in both the fed and fasted state as well as inter-tissue relationships, plus much more. This lesson serves as a quick refresher of basic arithmetic and algebra problems for those working in the field of healthcare. It reviews Roman numerals, decimals, fractions and more as they relate to healthcare.